Prop. 1, a $930 million, nine-year transportation levy backed by Mayor Ed Murray, was approved by 54 percent of Seattle voters on Nov. 3 to the delight of bus, bike, pedestrian and good roads advocates. First order of business: Safe Routes to School. "Seattle will get moving again," Murray told revelers (on Tuesday, Nov. 3) at the Belltown Pub, writes Mike Lindblom, transportation reporter for The Seattle Times before the final results were in. [Also see King 5 News video]. "If current trends continue, while the rest of the nation says no, Seattle says yes — we can be a livable city and an affordable city. Seattle can move forward." 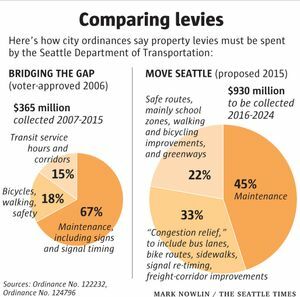 The measure, known as Move Seattle, takes up where "Bridging the Gap" left off. The property tax would supply $95 million a year, or about one-fourth of the city transportation department’s operating budget (pdf), not counting the waterfront seawall. In another Tuesday evening King 5 video, Mayor Murray states that if the numbers hold up and the measure passes, "the first thing we are going to do is build the safe routes, (and) sidewalks in every school in Seattle so that kids have a safe way to walk to school." Chris Daniels of King5 News states in a video that he had spoken with several political operatives who believed the measure would be defeated, particularly on account of the well-backed opposition. Speaking of which, he interviews "the financial backer of the opposition to Prop. 1, Faye Garneau, the Seattle businesswoman who single-handedly funded the (successful) 2013 initiative to move council elections to a district-based system [see below]," he writes. "(She) donated more than $300,000 to Keep Seattle Affordable." The ballot measure was also opposed by The League of Women Voters of Seattle/King. More than transportation was on Tuesday's ballot. "(T)he biggest winners appear to be Seattle’s urbanists — its advocates for more bicycling, transit and density," writes Seattle Times staff reporter Daniel Beekman who also reports on the outcomes of the aforementioned council district elections. "Candidates they backed have won or are ahead in every race as ballots continue to be counted." The election was the council’s first in more than 100 years with neighborhood districts. All nine positions were up for grabs, including seven district seats. Cascade Bicycle Club, Seattle Transit Blog, Seattle Bike Blog and Seattle Subway, urbanist-type organizations that endorsed in the council election, are getting their way. No council candidate endorsed by any of those groups is currently losing. See pie charts in Lindblom's Oct. 10 article with side-by-side comparison of Prop. 1 to "Bridging the Gap," the transportation levy approved in 2006. The largest share, 41 percent will go to "fixing streets." The next largest, 33 percent, goes to "congestion relief" but without the usual asphalt-laying seen in less progressive cities. Instead, funds will go to "bus lanes, bike routes, sidewalks, signal re-timing, and freight corridor improvements." 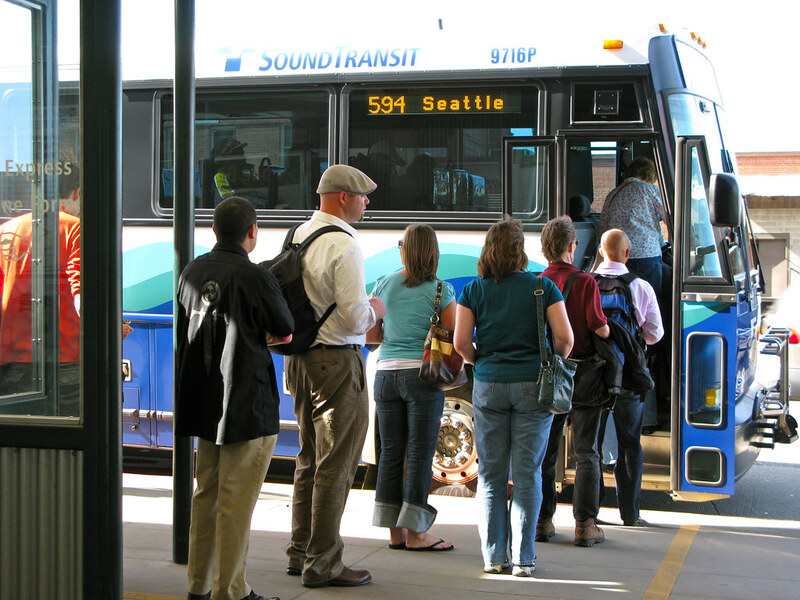 In an Oct. 29, Transportation For America blog, Chris Rall writes about the need for the Emerald City to make "smart transportation investments and developing the kind of policies that have already reduced the share of people commuting alone by car into downtown."